This past June 6th, I glanced out the sliding doors that lead to my backyard and saw a most exciting sight. 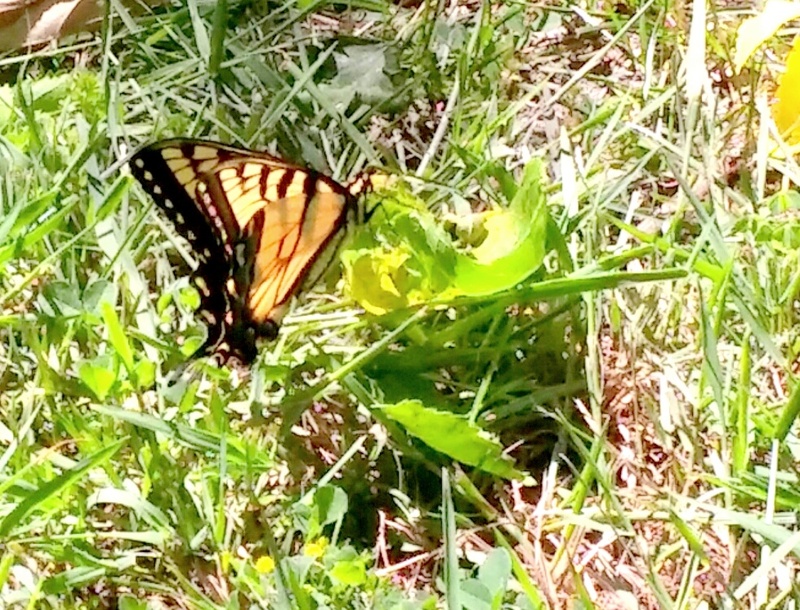 There was a black and yellow fluttering near the chain link fence that separates my property from the overgrown strip of land owned by the state. Knowing that camera was nestled in his bag in another room, I thought the prospects of receiving an image unlikely – but I had to try. I ran to get him and, together, we walked cautiously to the wild bush spilling over from the other side of the fence. She was still there, fluttering as she drank deeply of the nectar nature had provided. A beautiful, perfect tiger swallowtail butterfly. She spread her wings, allowing us to receive her image. 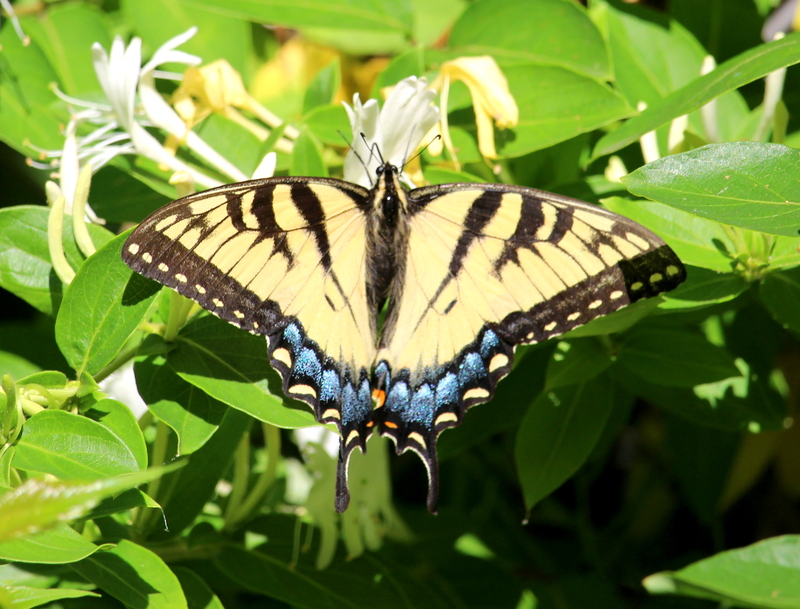 Three days later, June 11, numerous tiger swallowtails soared over and through my yard. Awestruck, I simply gazed at them. Two danced in the air as in courtship. I saw more of these lovely butterflies in my yard that week than I have in the 17 years I have lived in my house. June 11th was the second anniversary of my father’s passing into glory. I do not believe that my father has become a butterfly and now visits me as one. But I do believe that earth is “crammed with heaven” – and that this means far more than any of us can imagine. “Mom, that lady wasn’t wearing any shoes!” I was once told a child said upon noticing my discalced state in church one Sunday. It is true. My shoes almost always come off in church. I am standing on holy ground. Perhaps I would not wear them at all if not for laws and snow and professional norms (which I hold loosely when it comes to being shod) and stinging nettles. But I must relate one more thing. Last Thursday, I arrived in Minnesota to visit my mother. It was quite late by the time I got to her and I was worn out. But the next morning was sunny and warm. Her assisted living apartment is on the third floor, with treetops visible outside her window. She was sitting with her back to the window. “Mom – I think I see a butterfly!” At first I wasn’t certain, nor was I sure with all the fluttering what type it was. But it slowed down, fluttering near the window. It was a tiger swallowtail. Because of age and arthritis, it is not a quick and easy thing for my mother to turn around. Initially, I thought the butterfly had left – but no, it was still fluttering around the window. Slowly, my mother turned around and saw it too. In a moment or two, it flew away and I have not seen another since. What does all of this mean? I do not know. But I am keeping my shoes off. This entry was posted in Uncategorized on June 20, 2016 by mary. Thanks for this, Mary. I do like the E.B. Browning selection! I had never seen it before. About butterflies, I think we said once that an ancient Greek word for them is the same as the word for soul. I like that too. But discalced? In church? Though it must be hard, I admire that. It reminds me of the expected prostrations during the vespers service last Sunday (Pentecost). During the three designated prayers almost everyone dropped to their knees and put foreheads on the wood floor. Except those of us with creaky bodies. We bowed or leaned on one of the benches in the back. It was a good reminder that we were in a sacred space. For now I’m doing prostrations in spirit, and going barefoot only in the grass. Nothing hard in my practice, Al. I leave my socks on – unless it is very warm and I am only wearing sandals in the first place. I am actually surprised when anyone notices. Also, we Catholics do not spend nearly the time on our feet – nor nearly as much time in church – as the Orthodox do. We (unfortunately) gave up too much of what was “uncomfortable” in our worship. I don’t mean that we should seek discomfort for its own sake, of course, but seeking comfort for ITS own sake seems to me quite dangerous in the spiritual life. We have almost totally lost the notion of asceticism – except among monastics and those few who personally seek it out. I like your “creaky body” prostrations. It is not the perfect completion of the act that is so important as what it teaches us as we carry it out. Thanks for sharing.